CudaText - популярный бесплатный редактор программного кода. Программа отлично работает с более 160 языками программирования, позволяя осуществлять поиск, замену регистра/элементов текста, нумерацию строк, комментирование и создание закладок. При всей своей функциональности CudaText не нагружает операционную систему и не хламит реестр. Редактор способен выполнять массу задач, поэтому его часто используют в кругах вебмастеров. Например, для популярных языков программирования присутствует подсветка синтаксиса. Имеется возможность работать со шрифтами и несколькими документами одновременно. Участки с кодом можно сворачивать, а постоянно повторяющиеся выражения можно искать и заменять. Рабочее окно CudaText можно делить максимум на 6 файлов. Дополнительно эта программа отлично справляется со всеми задачами текстовых редакторов. CudaText поддерживает интеграцию внешних инструментов, шаблоны кода, работу с графическими элементами. Редактор совместим с плагинами, которые направлены на ускорение написания XSL/HTML/CSS -кода. Поддерживаются вкладки и закладки. Программа не требует инсталляции и отлично запускается с обычной флешки. 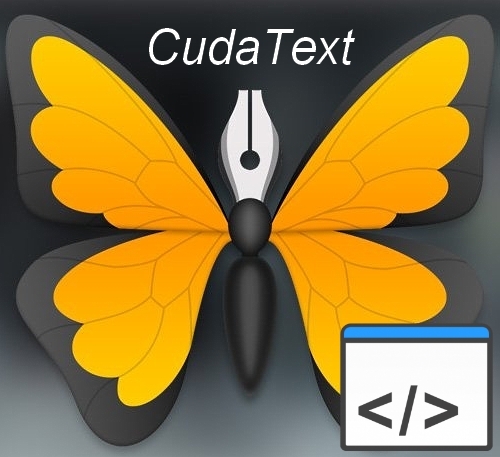 CudaText is a code editor, with syntax highlight for 160+ languages. Has lite interface with tabs. Has JSON config files instead of option-dialog. Supports Python plugins. Create programming scripts with this powerful tool that allows users to work concurrently on as many as six groups of projects. Programming scripts can come in a wide variety of containers, with similarly varied options for the actual coding language employed. Fortunately, this abundance of options does not mean that developers must necessarily employ a myriad of programs to write their code, as detailed tools such as CudaText allow software engineers to write down new code sequences quickly. The program's strong point is its ability to work with multiple snippet projects of any kind at the same time, in split views. Another noteworthy feature of the application is its support for syntax highlighting; all in all, around 130 lexers are supported, including commonly employed languages such as Python, C++, Java, and Ruby. The application is very forthcoming and newcomers will find it extremely easy to employ. It features the standard, clean text editing environment and all the lines are automatically numbered. A 'go-to' function allows one to jump to a certain entry quickly and case conversions can be performed automatically in the "Edit" menu. Working with multiple documents at the same time can be performed using various layouts. For example, one can have a 6-item grid, as well as a three frames horizontal display. What's more, each group can feature more than one file, thus significantly increasing the options when multitasking several projects. Bookmarks are supported and one can also adjust font settings; more-so, indents can be added and line comments can also be inserted. Once finished, users can save their work as code snippets specific to the language employed , ready to be compiled and built with any compatible external program. To conclude, CudaText is a valuable tool for developers regularly working with multiple snippets at the same time. The split view function can be a real asset in such situations and syntax highlighting is provided for around 130 programming languages, including most common options. * Split tab. Split view for 2/3/4/6 files. * Special auto-completion for HTML, CSS. Simple auto-completion for some lexers. * Command palette (Sublime style). * Text configs in JSON. * Plugins in Python language.